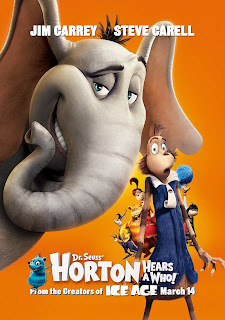 This week Jessi and I saw the movie Horton Hears a Who and let me tell you, it is a good movie. This movie is an absolute must see film. Even though we've all read the book and know the story, it's still fun to watch it unfold. Jessi and I both agree that our favorite character is the little puff-ball kid character. I don't remember the name, but it's the weird one kid and I laughed loud (too loud?) at everything she did. Not sure if you want to shell out the bucks to see it? Go ahead and watch the trailer yourself to decide. Better yet, just go see it and thank me later.